Another tip is to use a white wicker chair as a support for babies that can't yet sit up on their own. Never leave a baby alone. Sometimes babies can surprise you when they wiggle or lean in a certain direction and you don't want to take any risk of a baby falling. The main thing is to pose your newborn in a way that doesn't scrunch them up and look awkward. It take a little bit of patience to adjust everything to get the right effect. This baby portrait is also a high key portrait, meaning that it only has primarily light and white tones throughout. You can use a white background and drape a white gauze material over the background and across the chair to give it a softer look. Baby poses like this are good for babies that have enough neck strength to hold their heads straight. 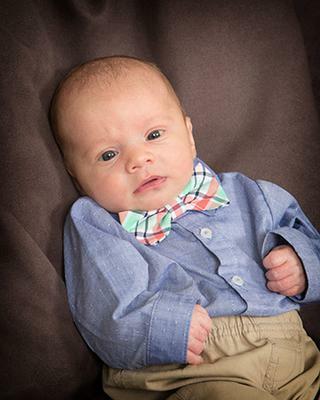 The other photo in this post, the baby wearing the bow tie, is a simple and safe way to pose a baby. Place your subject in the "crotch" of your sofa, chair or couch where the arm of the furniture meets the back. You may to to place a small pillow or blanket underneath. Adjust the set-up to fit the size of the newborn and the size of the furniture so that you have the right angle and it's safe and comfortable for your subject. This is a good way to pose anybody that does not have the ability to hold their head up on their own. Cover the entire set-up with a solid blanket or cloth to get a seamless background. Edges of a blanket or cloth are distracting and a simple solid color, without any stripes, patterns, or design are better. Busy backgrounds distract our eye and are not as attractive when it comes to portraits of people. Join in and write your own page! It's easy to do. How? Simply click here to return to Baby Poses.